In another convenient tale of convergence, this camera bag can also serve as a stabilizer for DSLR cameras. 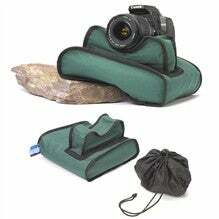 Yank out the camera, fill up the bag with rocks/sand/etc to keep it weighed down and plop the camera on it. Okay, it is a bit pointless besides keeping your camera from touching the dirty ground, but you suckers will buy anything. $48.